It may be hard to believe that it’s been six years since the last installment in Nintendo’s crossover fighting franchise was released, but now Super Smash Bros. has found a home on two of Nintendo’s consoles. While we won’t be able to get our hands on the Wii U entry until November twenty-first, the 3DS version of the game has already turned plenty of heads for the simple fact that it is a handheld version of the beloved fighter. This latest Smash Bros. may be running on the same engine that was used for Super Smash Bros. Brawl, but the two titles boast play styles that are only so similar. Gone are the inexplicable and unpredictable tripping mechanics, and less gimmicky are the characters. Both of these aspects make for a more enjoyable fighting experience, which is only enchanced by the inclusion of what is easily the most well-balanced roster since the days of Melee. Some players have already taken a liking to a handful of characters for competitive play, but relatively simple downgrades to Meta Knight and Pit as well as slight upgrades to Sheik and Zero Suit Samus leave a major impact on the overall feel of the game. Meanwhile, newcomers like Robin, Mega Man, and the Animal Crossing Villager feel right at home in the company of veterans Mario, Donkey Kong, Captain Falcon, Kirby, and many more. Similarly, the stages offer a great deal of variety, with the sizes of most ranging from small to medium. Battlefield and Final Destination see mere aesthetic changes, while the latest F-Zero and PictoChat stages are very slight variations on their predecessors. The designs of the Nintendogs Living Room or Find Mii stages may not boast the flash and flair or interactivity of environments like the Unova Pokemon League or Fire Emblem Arena Ferox, but this handheld version of Smash Bros. seems often more concerned about functionality than flamboyance. A large portion of these stages (nearly one-third, in fact) are re-used from previous Smash Bros. games, but are far better suited for the series’ 3DS outing than some of the Melee stages that were carried over to Brawl. Classic mode returns, with little change to the long-established pattern of squaring off against CPU fighters, be they metal, giant, or in a continuously spawning team. Before the start of each match, however, classic mode does allow you to select your path, the suggested difficulty of each match indicated by green, blue, and red paths. In the vein of Kid Icarus: Uprising, Classic mode allows you to gamble more coins to take on greater challenges on higher difficulty settings and reap greater rewards. All-star mode similarly remains largely unchanged from its Brawl counterpart, as you face off against multiple CPU fighters at a time in what is (more or less) the chronological order of their video game debuts, starting with Pac-Man, Donkey Kong, and Mario, and working all the way on up to Greninja, the Wii Fit Trainer, and the latest Fire Emblem characters. 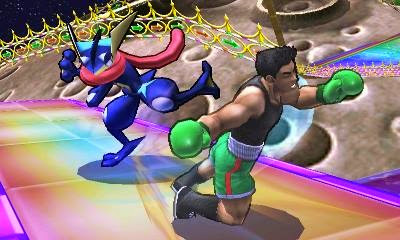 Training mode still allows you to test out Smash’s many items and stages, as well as hone your abilities in chaining combos (now made more easily identifiable thanks to a successive hit counter and damage percentage numbers that pop up when your character makes contact with an opponent). Stadium sees the return of both the Home Run Derby and Multi-Man Smash, and again, little has been changed on either of those fronts – 100-Man Smash, Endless Smash, and Cruel Smash have you taking on hordes of Mii Fighters, but the concept remains the same. New to this Smash Bros. is Target Blast, something of a hybrid between Home Run Derby and the old Break the Targets mode. 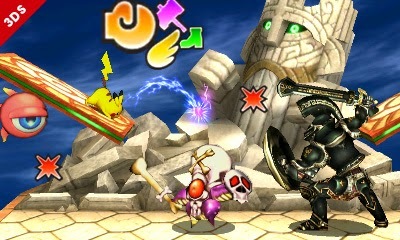 In Target Smash, players will have a brief window of time to deal as much damage as possible to a bomb, which they can then launch at a series of targets, blocks, smaller bombs, and occasional bonus trophies and abilities in the hopes of knocking these objects into one another and chaining a high score. Think of it like Angry Birds, except that you have but two successive shots to take out as many targets as possible. Smash Run operates similarly to Kirby: Air Ride’s City Trial mode, as players have a set amount of time to explore every nook and cranny of a gauntlet-style stage, taking on grunt enemies from many of the game series represented in Smash Bros. How you choose to dispatch these foes, which paths you take, and how many secret rooms you discover influences which stat boosts you will receive, which are then factored into an endgame challenge, be it a vanilla Smash bout or something more directly related to your newfound upgrades like a footrace through a multi-layered course. Custom versions of each character can also be crafted from a separate menu, and can be used in some of the game’s various modes. These customization options not only include boosts and tradeoffs for a character’s speed, defense, and offense, but alternate moves as well, all of which can be collected as rewards through Smash Bros.’ many game modes. 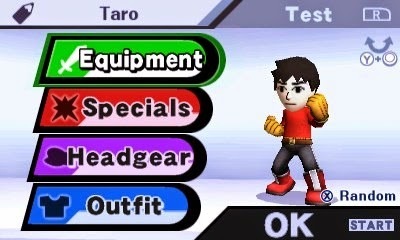 Custom Mii Fighters take this concept a step further, allowing you to give them steampunk outfits, samurai armor, or a mech suit, and designate them as belonging to one of three classes – Brawler, Gunner, or Swordfighter. Challenge panels make a return from Brawl, though the early sets are decidedly easier than in the previous installment, asking that you play three matches as Meta Knight, hit just over 2500 feet in Home Run Derby, customize a handful of characters, and so on. 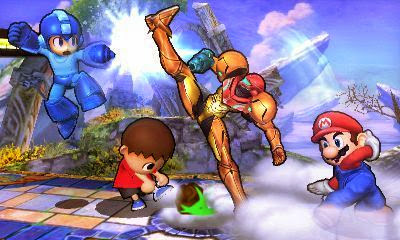 Later challenge panels do up the ante, though this Smash Bros. is more generous with the number of hammers you earn that can be used to knock out most any space on the board. The rewards for completing these challenges include Smash stages, Mii Fighter stat boosts, sound test tracks, and trophies. While trophies can also be collected from the single player modes, Super Smash Bros. for 3DS introduces both a Trophy Shop and Trophy Rush mode. The Trophy Shop’s offerings will rotate frequently, even slapping a discounted price tag on some, and can be purchased with either in-game coins or 3DS Play Coins. Meanwhile, Trophy Rush is a more robust and fast-paced evolution of Melee’s Snag the Trophies, as players must break down blocks before they stack too high in order to fill a meter to initiate a feverous stream of coins and trophies to fall from the sky, all while avoiding electric balls and explosives. Betting more coins at the start of Trophy Rush will net you more time to try and improve your collection, but any fall out of bounds will subtract fifteen seconds from your remaining time. One of Brawl’s biggest shortcomings was in the highly unreliable online play. While this new Smash Bros. certainly improves on its Wii predecessor’s faltering, it too is far from perfect in this aspect. Some matches are spot-on, and only once in a blue moon does the online play teeter into the realm of being wholly unplayable. More often than not, however, this multiplayer mode lags just enough to be a constant annoyance. The Streetpass mode known as Street Smash is underwhelming as a top-down ‘bumper cars’ sort of matchup, wherein the goal is to knock other player icons off a small platform. While Streetpass features of any 3DS title are hardly the highlight of the experience, something that was more interactive or dealt out greater rewards would no doubt have been better received. The 3D effects, while still a cool feature as in nearly any 3DS game, are not utilized for much beyond the added depth perception of stages. It removes potential distractions from the equation, but compared to many other games on the system, does feel a bit underwhelming, especially when the character models are so small compared to their surroundings. On the whole, however, the visuals are thoroughly impressive – bright colors on the Animal Crossing Island pop, metallic textures in Super Mario’s 3D Land glisten, and all of the character models have such fluid and highly-animated motions to match their super-tight controls. Personally, I have only found myself losing track of my own character in Smash on two or three occasions since launch day, but for those concerned with being able to see who’s who on a handheld device, the character outlines can be thickened from the options menu. For those concerned that Nintendo’s beloved fighter might lose something in translation or fail to work on a handheld entirely, you can lay those worries to rest. 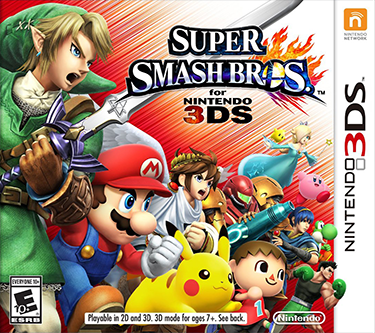 Super Smash Bros. for Nintendo 3DS is the best entry in the series since Melee, even surpassing the Gamecube classic in many respects. With so much to do and so many characters to play as, it’s easy to pour hours upon hours into this title and not become even the slightest bit bored with it. The easy settings may be a bit softer for younger players and newcomers to the series, but on a higher difficulty, Smash Bros. for 3DS carries on the tradition of those Smash titles that came before it. If this handheld entry is but a taste of what is to come from its Wii U counterpart, we’re sure to be in for a real treat. With that in mind, this is a great release all its own, and a standout entry in the already stellar lineup of the 3DS’ library of games. 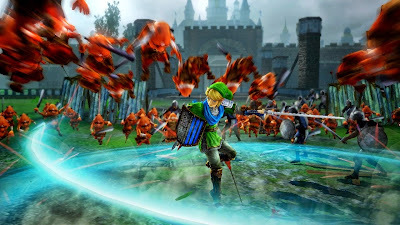 One of the more out-of-the-blue crossover announcements in recent E3 history was that of Hyrule Warriors, a Zelda-themed hack-and-slash in the vein of Dynasty Warriors and similarly developed by Koei Tecmo. As the game neared release, Nintendo began to trickle forth information about the various gameplay modes and playable characters, from the more famous Ocarina of Time and Twilight Princess allies to some of the series iconic villains. 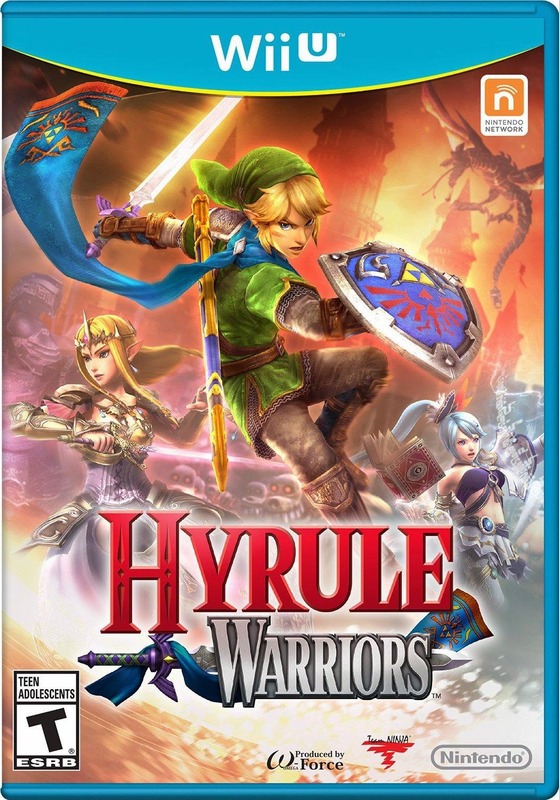 But it was never any secret that Hyrule Warriors would play more like a Dynasty Warriors title than any Zelda title – so the real question is, just how much like DW is the final product? In truth, the answer is both a bit lengthy and complicated. At its core, the gameplay leans extremely heavily toward the Dynasty Warriors camp. Combos of Link’s swordslashing, Darunia’s hammer swings, and Fi’s graceful dancing are your primary means of cutting through a sea of enemies in order to capture bases and increase not only your army’s troop output, but their morale as well. Troops with a higher morale will perform better in battle, more offensively and defensively, and achieving this within a mission can leave you with a greater confidence that your CPU followers will have little trouble holding down the fort against enemy invaders while you scour the many sprawling maps for bonus materials or extra content hidden with Gold Skulltulas. Striking down enough foes will fill up your special attack meter, which can then be unleashed against more of the ever-spawning Bokoblin, Moblin, or Stalchild forces to wipe out a great number of foes in one fell swoop. These special attacks can be great for speeding up the capture process when attempting to take over an enemy base. Each character also has a magic meter that, when full, can be activated in order to slow time for a brief period to inflict major damage to specialty troops and captains, as well as other CPU controlled characters. Since the magic meter is filled up with magic jars as per Legend of Zelda tradition, you will have to collect these from smashing jars within bases or hoping enemies drop them upon defeat. Magic jars are, however, one of the most rare drop items from enemies, so do not expect to reap the rewards of a full magic meter more than once or twice on most missions. Also drawn from the Zelda franchise are the secondary weapons like the bow, bombs, boomerang, and hookshot, all of which can be used by any of the playable warriors, and all of which have surprisingly practical uses. The bow is reserved exclusively for ranged shots against poisonous Deku Babas and certain boss fights, while bombs can be used to thin out troops as well as discover secrets hidden behind cracked walls. The hookshot can give Link and company a shortcut to higher ground, or can be used to wrestle airborne foes to the ground, and the boomerang can be used to dizzy multiple foes with each toss. Each of these secondary weapons can receive temporary boosts in power and range thanks to another kind of item drop, which will indicate which item is to be granted the power boost before you grab it. 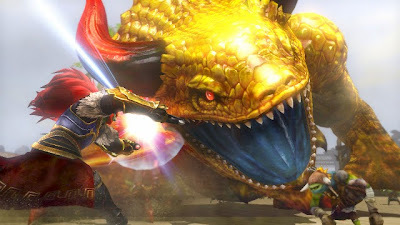 Speaking of boss fights, Hyrule Warriors features showdowns with classic monsters like Ghoma, King Dodongo, and Manhandla, all of which handle very similarly to their 2D and 3D incarnations in past Zelda adventures. While boss encounters are not present in each and every stage, they are certainly the highlights of the missions they are worked into. Specialty enemies like the Gibdo, Aeralfos, and Poes will still take damage from most any weapon, though each is considerably weaker to a different weapon in particular. When weakened, these enemies will momentarily display a defense meter above their heads – hit the meter enough times, and their defense will be broken, giving you a golden opportunity to inflict lot of damage, sometimes finishing them off altogether. Upgrading character skills like health and attack damage results from the particular items you gain from fallen enemies. Meanwhile, weapons can be combined to carry over bonuses like increased damage from a particular combo or a health buffer to a weapon with a higher power and star rating (effectively the same weapon ranking system as in traditional Dynasty Warriors games). Most characters have a second or even third weapon that can be discovered along their journey through Hyrule, as well as a final, more powerful form of each of these weapons that can hold three different upgrades as opposed to just one. Different potions can be brewed to grant brief power boosts both offensively and defensively, though the most practical to carry in to battle will likely always be that which restores the majority of your character’s health. These can prove especially useful if you find yourself pinned in a corner and subsequently the victim of an onslaught of combo attacks from one of the enemy warriors. While the plotlines of any given Zelda game have drawn heavy influence from European and western fantasy works, their tales have been largely universal, not identifying strictly with one culture or another. Frankly, it’s an approach that likely largely explains why the series has been so universally well-received for more than twenty-five years. The story mode of Hyrule Warriors does account for the divergent timelines of official Zelda lore, but falls outside of the canon, and is admitedlly simple in its aims. According to this spinoff game, there were forces capable of witnessing all versions of the tale of Link, Zelda, and the Triforce, but they were never meant to interfere in any way. When curiosity leads Cia, a mystic woman of this clan, to contemplate what it is that makes Link such a great and courageous hero, dark forces kept long at bay begin to take hold of her, influencing her ultimate decision to travel to the land of Hyrule and amass an army capable of challenging the kingdom. Enter Zelda and Impa, who turn to Hyrule’s army and one blond swordsman in particular to defend the castle and surrounding fields. As the fighting escalates and both sides hatch plans to try and trump one another, the trio encounters Lana, a girl from the same clan as Cia, but who would seek to aid the warriors in attempting to halt Cia’s advance across Hyrule and convince her to return to her old ways. As Cia utilizes the Gate of Souls to draw power from many alternate versions of Hyrule, so too do Lana, Impa, and Link seek out the aid of Darunia, Midna, Fi, and other veteran Zelda characters. But while all this attacking, defending, and countering is occurring, other malevolent forces lie in wait. Challenge mode throws players into singular scenarios with one main goal in mind before the end of the mission, but keeps things interesting by throwing new and unexpected minor challenges as things progress. More time-consuming is the adventure mode, which asks players to complete a series of specific challenges with certain restrictions in place, including time a ten minute time limit to defeat five-hundred enemies, a battle against some of the game’s stronger foes where all attacks (yours included) deal massive damage, and quiz games that will test players’ knowledge of enemy weaknesses. Adventure mode’s overworld map pays homage to the original NES Legend of Zelda, and players will collect candles, bombs, compasses, rafts, and more as they earn higher rankings on these various challenges, all of which can subsequently be used to uncover health upgrades for your unlocked warriors, as well as few of the playable characters. With regards to these playable characters, the game draws twelve faces from across the Zelda series and introduces one newcomer in the form of Lana. Each of these warriors has a unique play style that utilizes similar button combos with greatly varying results. 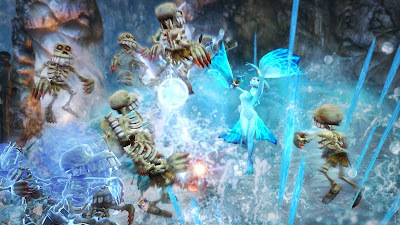 Midna can summon a fist from her helmet and hurl foes wildly about, Shiek can create a small damaging circle by playing the harp, and Ruto flips back and forth through pools of water that manifest in the most unlikely of locations. Despite the roster not being nearly as large as in most Dynasty Warriors games, Hyrule Warriors does well to cater to a variety of combat strategies while offering well-balanced offensive and defensive capabilities to each character. The creativity drawn from Ocarina of Time, Twilight Princess, Skyward Sword, and more is a wonderful way of catering to die-hard Zelda fans, though Lana’s moveset is a bit lackluster in its flash and flair when compared to nearly any other one of these iconic warriors. Most of the playable characters look very similar to their original designs. Ghirahim retains a semi-cel-shaded overlay, Zant and Midna are bear more stark color patterns and intricate details, while Darunia and Ruto’s character models are the most simplistic of the bunch, as they hail from an older 3D era. 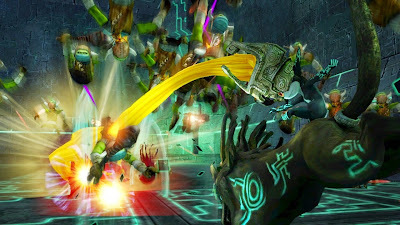 Link, Impa, Zelda, and Ganondorf, meanwhile, all wear outfits that act as crossing points between Zelda and Dynasty Warriors - Link’s green tunic is subtly accented by a blue scarf, Zelda’s armor and dress a hybrid between her 2D and more recent appearances, and Impa’s clothing largely inspired by her counterpart in Skyward Sword, though appearing to hold some influence from Ocarina of Time as well. Ganondorf’s design, however, proves the most polarizing, as his long red hair, angular armor pieces, golden crown-like headpiece, and large jagged swords imply a more distinct eastern influence – somewhere between feudal Japan and Mongolian horde. 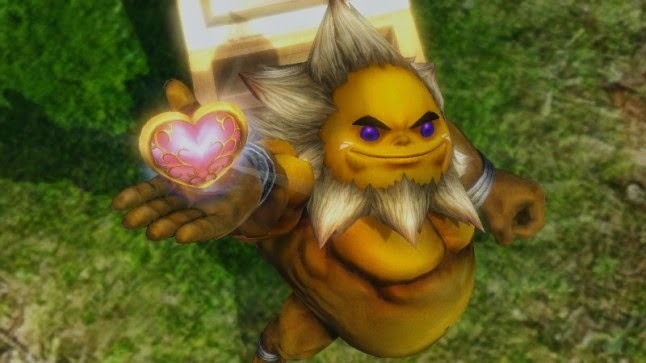 Hyrule Warriors also pays homage to its roots by incorporating many classic Zelda tunes infused with rock riffs and dark electronic sounds. While artistically the game may not be representative of the next proper installment in the Zelda franchise, seeing the land of Hyrule and all its denizens in full HD is most pleasing to the eyes. Hyrule Warriors hits a couple of snags in its design, largely resulting from the save system and respawn locations. It is possible to drop a save spot at any given time during a mission, though this is one of the few pointers the tutorial segments do not take time to explain, and given the generally fast-paced nature of any mission, it’s a feature that can effectively go ignored for an entire playthrough. Each time you complete an in-mission objective, however, the game automatically sets a checkpoint for you, which is typically quite convenient, save for instances when the game respawns you in front of an enemy warrior or boss character who spams you with combos that result in a death as sudden as your return to the fight. Hyrule Warriors is by no means a perfect game, not the most extensive one, but it does emphasize heavy arcade-style hack-and-slash design that delivers mindless fun without losing its identity as a proper crossover.